What’s Old about the Old Testament? Many years ago, more years than I will admit to, I went into a Jewish book and supply store and requested a copy of the “Hebrew Old Testament.” I recall vividly the look on the store clerk’s face, and I apologized, but it’s not an error that you can recover from easily. To a Jew, of course, it’s the Bible, not the first part of it that must be finished with another text in another language. Many Christians are unaware, or only vaguely aware of how their faith relates to the Hebrew scriptures, and thus it is very easy to be offensive in one’s language without intending to. Unfortunately, there are those who will be intentionally offensive. Over the years I changed my terminology. I didn’t actually abandon the term “old testament,” but I took up a somewhat complicated usage, one I have to explain regularly. That doesn’t bother me, as I believe that in explaining it, I invite my Christian audiences to think about things they may not have considered before. That’s what I’m going to do here. First, the terms. Old Testament – I use this when, and only when, I’m referring to these books as part of Christian scripture. For reasons I will expand on below, I believe that a sacred text differs according to the way it is used, and only fully functions as part of a faith community. Jewish Bible – I use this term less frequently, and largely when I’m going to quote actual Jewish scholars expressing their views. I have found that studying the Jewish Bible using commentaries and other tools produced by Jewish scholars of various branches of Judaism is powerful and very helpful to me, but I prefer not to have people think I am expressing the Jewish point of view in other than a limited sense. Hebrew Scriptures – Though I didn’t know it, this was what I set out to study when I chose to major in biblical languages. By Hebrew scriptures I refer to these same books as Ancient Near Eastern literature and look to read them as such literature, looking for their historical setting and meaning. Some assume that one can simply read ancient texts and move directly to their applicability to a modern setting, but that is precisely what requires a community of faith and a hermeneutic process. A hermeneutic process cannot be validated, in my view, apart from a community of faith. I use this term when I do not intend application to the present but rather to discuss how the text was used and understood at a time in history. Some would suggest either that Jewish or Christian interpreters have the right process of interpretation and application, while the other fails. Now it’s likely that various of us are wrong about some things and right about things, and I believe in objective truth, but it is difficult to call things right or wrong without also considering the community of faith that’s involved. We would have to talk about whether a whole community was right or wrong, and that’s even more difficult! Some Christians may be wondering at this point whether I believe in evangelism and disciple making. I do. I just don’t believe that those things are about intellectual persuasion. Rather, conversion is an act of God, not an act of persuasion. Saul on the road to Damascus did not encounter an intellectual argument. He had a powerful encounter with the one he would call Lord and Savior. Other experiences may take more time and be more subtle, but I think no less an act of God. A key note here: Christian witness must come from Christian community. This is a major problem for the church today. In fact, the community of faith is central to interpretation, application, and therefore to witness. When I started my studies in biblical languages and literature, it was my expectation that I would learn the history, determine the historical context of any verse or story, and the intended lesson, which would allow me to correctly and objectively apply that lesson to my time and situation. The reality? Not so much! The results are often interesting with current American audiences. I’ve been using these two verses for years and I have seen no real change, other than differences based on the demographics of the audience I use it on. There will be people who are willing to accept both, but there are only a few of those. There are many who want Leviticus 18:22 to be applicable but not Leviticus 19:33-34, and those who want 19:33-34 to be applicable but not 18:22. Those who have thought through that application and provided a hermeneutic that can be consistently applied to texts are few and far between. Doubtless among my readers there are those who have thought these verses through and can explain their use of one, both, or neither in determining modern theology. If you have done so, you are engaging in hermeneutics, and you most certainly have been influenced by your faith community. For example, many Christians will claim that Jesus or other New Testament authors have reaffirmed one text or the other. Others may feel that one fits with Christian values better. Others may try to discuss cultural applicability. Yet others will say, “The Bible says it, and I believe it.” That, of course, is problematic in Leviticus, especially for Christians. We don’t do most of what Leviticus tells us to do. If you doubt me on that, read Leviticus 11 & 13. There are many more examples, but that one will do. In this case, though different filters are used, Jews don’t expect gentiles to keep all of those rules. They have a very limited set that come from outside this portion of the Torah that would apply to us. Christians have a different filter. The key here is that we both have a filter. Thus my goal was not realistic. The process of study was, however, quite useful. There is a value in historical study. It just doesn’t convert without difficulty into application. So working in reverse, I look at the term Jewish Bible. It is a book given to Israel and preserved by them. Paul makes the Christian affirmation of this in Romans 3:1-2 and elsewhere. We might learn to understand the text better. Because the books of Hebrew scripture have been borrowed and reused we have the benefit of seeing it from different perspectives. This is an advantage no matter what one is trying to do. One of the great features of Jacob Milgrom’s Anchor Bible commentary on Leviticus is that he looks at the history of interpretation including Christian and secular looks at the text. If we are to affirm the Jews as God’s chosen people, then at a minimum we should have some idea who they are and what they believe. It’s a great joy to do it! There are a couple of fundamental points we need to keep in mind in studying the Hebrew Bible as the Old Testament of Christian scripture. First, we need the other views. It is impossible to understand where people were in the first century as Christianity came into being without looking at how those people would have seen it. Second, because our scripture is so seriously rooted in Hebrew scripture—even the term “New Testament” comes from the Old—we need to understand these roots. Regarding the first point, I am often annoyed by Christians who make remarks such as, “Jesus is so clearly taught in the Old Testament! How can the Jews not see this?” And yes, the Apostle Paul can get on my nerves. He should remember that he had to be pretty much struck by lightning to change his mind. He shows the zeal of a convert on this point. But those of us who have not been struck by lightning should be aware of the interpretive problems, and also of what Jewish interpretations are. Besides the Jewish commentaries I use, I keep a copy of the Jewish Study Bible from Oxford University Press at hand for quick reference. Those who use Paul’s writings in an antisemitic sense should both be aware of his own attitude at the time and also of the difference between our time and his. That is also hermeneutics. “Paul did it, so I can,” is not a safe statement in a world that has changed. Paul spoke to a group that had not truly separated from Judaism at the time. We speak to a world in which persecution of the Jews has been rampant and vicious. What might he say regarding his “brothers and sisters, his fellow countrymen according to the flesh” (Romans 9:3)? Or how might Jesus address descendants of the Pharisees in the light of what his self-proclaimed followers have done in the meantime? He is addressing his own denomination, but the point applies to any Christian group, I believe. Thus I read the Bible unabashedly Christocentrically as a Christian. My doctrine forms around the person, mission, and teachings of Jesus. At the same time, I have no need to deride other approaches, nor should I be unable to discuss those other elements from a compatible point of view. Someone who does not accept Christ, as I do, is unlikely to be interested in the “centrality and primacy of Jesus Christ.” Yet we can discuss the text. Failure to recognize differences in our approach to hermeneutics is at the root of many of our most fierce and least constructive discussions. At this point, I need to make a note regarding thinking people are wrong. Any time one thinks one is right, one necessarily thinks those who disagree are wrong. We get into problems because we then look down on those who disagree with us, holding positions contrary to our obvious truth. I think this sort of behavior is both unnecessary and does not indicate confidence, but uncertainty. In all areas of life, I think there are two goals: 1) We must seek truth in some sense, and 2) We must be able to maintain community (faith, local, national, and world) while still disagreeing. I think it is unfortunate when we feel we have to smooth over our differences in order to get along. We should instead celebrate our differences and dialogue about them so that we can improve. I consider efforts to force change to be counterproductive. The best way of constructively changing anyone’s view on anything is respectful dialogue. Being respectful doesn’t mean abandoning your principles. It means listening attentively and courteously and clearly explaining your viewpoint. Contrary to popular option, it is not the noisiest who are firmest in their convictions. Only one who is confident in what he or she believes, including sufficient confidence to recognize and admit the unknown, can get the most out of dialogue. So How Old Is It? The problem with the word “old” is that we tend to see it in negative terms such as out of date, obsolete, and requiring replacement. That is whenever we’re not fantasizing about a golden age that never actually existed. In the case of the Old Testament, Christian theology works against making it a golden age. Why would we have a new testament if the old one was a golden age? I’ve discussed this extensively with reference to the book of Hebrews, which has the statement, rather unfortunate when taken out of context (as it usually is), that “what is becoming old is soon to disappear” (8:13) is sometimes used to suggest that the Old Testament is no longer applicable and in some cases hardly worth studying. If it’s obsolete, why red it? I’m not going to go into a study of Hebrews, but let me simply say that if the author of Hebrews thinks the Old Testament (as a collections of books) is obsolete, he has cut the limb off behind him, as he bases all his arguments on texts from that same Old Testament. He has other concerns. And that is my first problem with the term “Old Testament.” The books of the Hebrew scriptures do not constitute a covenant or testament. They contain more than one such covenant. So if Hebrews, or any other passage of the New Testament refers to the passing of the “old covenant,” they aren’t referring to all the books of Hebrew scripture. The division of the Christian Bible into Old and New Testaments tends to create some errors. I should note that it also presents an important division. What did we borrow from someone else and what did we add? That’s a good distinction. It might be more accurately presented in other ways. It would help if Christians recognized the Jewish divisions, Torah, Prophets, and Writings. The covenant with Israel is stated in the Torah, and a great deal of the rest is dedicated to discussing how to keep that covenant, or proposing God’s new covenant (yes, I mean new). “New covenant” (or testament) is not a New Testament idea. Jeremiah 31:31-34. This proposed new covenant differs from the old one largely in the enabling grace given to people to keep it. The main problem with the old one, a problem that might be seen to make it obsolete, is the failure of Israel to keep it. Which leads to another Christian problem. We often look at the experience of Israel with disdain. How could they be so unfaithful? Why didn’t they just keep the covenant God had given them? Why turn to other gods? We do all of this while we turn away from God and ignore what God has commanded ourselves. We would be well advised to heed Paul’s command in Romans 11:20, “put away your pride and be on your guard,” which he gives precisely in reference to this attitude of superiority. My next problem is simply with the view of “old” that we often hold, as though God’s later acts are better than his former acts. People and circumstances change, but I believe that God’s aims stay pretty much the same. The covenant with Israel expresses accurately God’s desire for his chosen people, Israel. That doesn’t mean we can’t learn from it, but we should remember who it was addressed to. I would suggest that one of the key elements of that covenant was to establish an identity for Israel, an identity that was necessary to allow them to carry out their mission. I would suggest that goal was carried out with great success. More than 3000 years later we hear the echo of this in Tevye’s remark in Fiddler on the Roof, “I know, I know. We are Your chosen people. But, once in a while, can’t You choose someone else?” The Jews have a very strong identity. While we may not be subject to the same regulations, we still need an identity as God’s people. There is a history here that we need to learn. The covenant is, in a sense, as old as the hills and as new as tomorrow, because God is still looking for ways to get his message out to the world. So the Old Testament needs to be seen not as a single entity that has become obsolete or been replaced, but as the witness to God’s activity which has been continued in other ways. If we pay attention to this, we may be able to better understand some of the goals of the New Testament. But even further, the New Testament itself doesn’t come in a single package. It is also a collection of books that looks at the witness of Jesus, the witness to Jesus, and the vision of the future of God’s world. Without understanding this background, we are unlikely to understand what New Testament writers were up to, because we don’t know where they are coming from. Despite my wordiness, I have left much untouched. How old is the Old Testament? As old as the hills and as new as tomorrow. How old is the New Testament? As old as the hills and as new as tomorrow. Both are rooted in and lead to eternity. We ought not to discard either. Earlier today I posted links to a video by Andy Stanley and a response by Michael Brown. Some people have commented on this issue indicating that it was unfair to “attack” Andy Stanley about his views. (These were not on my blog post or its Facebook link; the controversy is widespread.) I have a few comments on this. There are those who claim that one has to listen to the entire series in order to get the context and respond. I would disagree. If you make a short video, be prepared to be challenged based on the content of that video (or audio file or blog post, for that matter). I think there is sufficient material in Stanley’s presentation to which one can respond. It’s interesting that one is expected not to respond to Stanley, yet Stanley is critiquing quite a number of other Christians. I do not criticize Stanley for doing this. If you’re going to assert that X is true and Y is not, you’re going to critique someone. As in #2, those who critique Stanley are in much the same position. If they are to assert that X is true and Y is not they will obviously be offering a critique of those who hold Y. Which leads to my main question: Why is it wrong to question theological statements, especially sweeping ones that are offered as a critique of other Christian positions? As for the “Marcionite” argument, we’re in a standard name-calling situation. For some reason, we think that by labeling someone we have responded, and, on the other hand, by defending ourselves from a label, we’re defending our position. Forget the label; ask whether the viewpoint is correct, or whether it can be improved upon. I believe it is very important to discuss theology, and discussion involves the assertion that some things are less right than others. The idea that we can never point out what we believe is an error in the teaching of another is ludicrous. Now if we arrogate to ourselves the ability to judge someone’s salvation or their standing with God, that’s another matter. But to assert that some things are true is by nature to assert that others may be less accurate or perhaps untrue. In this issue, I actually go farther than I perceive Michael Brown is going. I don’t believe there is a singular, straightforward distinction between the Hebrew Scriptures and the Christian New Testament. I believe that there are many cases of God changing the way in which he relates, as God carries out God’s plan to save humanity. Thus the Christian Bible, consisting of the Old and New Testaments should be read as a single story. There are points of distinction, but they occur in a variety of ways and are usually envisioned ahead and then their interpretation grows afterwards. I object to simply dismissing a portion of scripture. You have accomplished nothing of value, I believe, by unhitching the New Testament from the Old, first because they are connected by much more than a hitch. There is an earth-shattering change with the incarnation, the life, the death, and the resurrection of Jesus, but this takes place in the midst of a growing understanding of God and his actions in the Hebrew Scriptures, and we struggle to understand this completely millenia later. As an example, many—I suspect the vast majority—of those who heard Jesus may have been surprised by his attitude toward the gentiles, and may have similarly been concerned by the church’s mission to the gentiles. Indeed, the gospels and Acts record that many were. But Isaiah (2nd/3rd Isaiah, 40-66) would not have been so shocked. One may point to differences, yet I think Jesus appears no more radical in his look at the law than Isaiah 56. So if the audience was shocked, they were missing some of the lead-up story. I think they may have been less shocked than modern people imagine. There were many viewpoints in Judaism at the time. And if Isaiah 56 wasn’t radical enough, then perhaps Ruth or Jonah would take the place of radical scripture. Or, if we really wanted to get down to it, we might note Genesis 12:3, Genesis 17:5 (from Abram’s call and covenant). There are certainly things that are hard to deal with in the Hebrew scriptures/Old Testament. There are also some of those in the New. My problem with a dismissive solution, broadly stated, is that the texts are still there. God has been working with people for a very long time and people have been interpreting God’s actions for a very long time. So let’s disagree, critique, and grow. A bit of love and generosity would be good as we do so. I struggled with the title, as this is almost entirely links, and the issues raised cover so much ground. I’m posting these particularly for my Romans study on Wednesday nights. In both the current class and my previous series on Hebrews I maintained that the New Testament was not intended to set aside the Old, or the Hebrew scriptures. In fact, I refer to the idea that Hebrews is doing that is an author climbing out on a limb and then cutting it off behind himself. On the Charisma Magazine web site Dr. Michael Brown responds to a video by Andy Stanley. I would suggest listening to Andy Stanley and see if you can hear some of the approaches to the Old Testament I mentioned. Michael Brown provides what I consider a good response. I’m glad to note he sent Andy Stanley a copy of his critique (see Brown’s article), but I do not accept that they are not that far apart, as Stanley says. Note that the majority of the issues are in the first five minutes of the video, but I think it then pervades the rest in more subtle ways, then comes out more strongly at the end. Anyone who has heard me teach will know my view on this. Here are a couple of related books I publish. I believe that it’s easy to let our theology keep us from reading the Bible, especially the narrative parts. The Bible is filled with stories. One example is the story of the flood. When Genesis 6 says (using the KJV), “It repenteth me that I have made man,” the first reaction is to try to explain how God didn’t really repent, thus preserving doctrines of omniscience expressed particularly in foreknowledge. A vigorous desire to preserve one’s theology can prevent one from hearing the story as it is actually told. Jonah is just such a story. It’s very easy to make this a story about obeying God. The story was explained to me when I was a child as an illustration of the bad things that could happen to you if you went against God’s will. Another lesson, often taught at the same time, is that God can and does work miracles. Many people have seen belief in the whale (really more like “great fish”) as a test of one’s belief in the truth of scripture. But to spend our time on the reality of the great fish, whether to disparage the idea or uphold it, is to stray from the story. I’ve been delighted to publish a couple of books by Bruce Epperly that deal with Bible stories from a less theologically defensive position. Bruce tends to let the stories speak and as such he gets lessons from them that we might otherwise miss. A few months ago we released Ruth and Esther: Women of Agency and Adventure. I commend that study to you. This week we released another book about stories, Jonah: When God Changes. Just the subtitle is likely to unsettle a few people. I think it’s good to be unsettled. I think that Jonah was unsettling when it was first written and it was intended to be. We often have to work hard to love and care for people who are actually very similar to us. We tend to discount the command of Jesus to love our enemies. But in Jonah we have a call to love people we now hate—and with good reason!—and to take God’s message to them. While Jonah’s message sounds like a “fire and brimstone” sermon, it becomes a call to salvation, just as Jonah feared it would (read the last chapter)! Bruce really works this little book and calls to our attention things we might normally miss in pursuit of theological comfort. I suggest that you give up that comfort and read the book! We’ll have it for $4.19 pre-order pricing (even though it’s already printing) on Energion Direct. We’ll keep that up through Labor Day. Find a couple of other books to go with it so your order is at least $9.99 and you’ll get free shipping. I ran across this while looking for something else. Dr. Alden Thompson was the author of the first book sold by Energion Publications, though it was published before I bought and renamed the company. We’ve now published a 5th edition, and this is overall our best selling book. In this presentation Alden using a number of Adventist specific references, but I think the message comes through. There are a variety of responses to the violence in the Old Testament. One of the keys to Alden’s approach is his insistence that it is all inspired, even the parts we don’t like very much, and he makes that claim in the video. Alden’s teaching at Walla Walla University was quite formative of my theology and I still enjoy working with him. We’ll be releasing a second edition of his book Inspiration: Hard Questions, Honest Answers later this year, as the publisher of the first edition allowed it to go out of print. No, I’m not going to do it, but I’m going to ask Dr. Bob Cornwall some questions about it. He’s currently preaching a series in his church from 1st & 2nd Samuel. Bob is one of my Energion authors (see his book list here), and is editor of the two book series we publish in cooperation with the Academy of Parish Clergy, Conversations in Ministry and Guides to Practical Ministry. You can find more information about this event on its Google+ event page. I’m going to ask Bob how he handles the authority of the text he is preaching from, and especially whether he will deal with some of the more violent passages and how he will preach from them. There are quite a number of passages in the books of Samuel that could be very troubling to a 21st century conversation. This morning, I was reading one of those: 1 Samuel 15. You can read the whole thing if you want to get a general picture, but let me just summarize here. God tells Samuel to pass the order to Saul, King of Israel, that he should go and wipe out the Amalekites. He is supposed to designate them as herem, meaning that they are devoted to destruction, every person, every creature, every thing is to be destroyed. And lest we be tempted to soften the story, we are told that this included men, women, and even nursing babies. Saul disobeys God and doesn’t kill everyone. The best of the animals are preserved, and the king is taken captive. Saul blames this on the people. God blames Saul and says he has cut Saul off (or at least Samuel says God says this) from being king over Israel. This story opens the cycle of stories about the conflict between David and Saul, which ends with Saul’s death in battle and David’s accession to the kingdom. Get a modern lesson from it, ignore the gory details, and hope nobody notices. I remember hearing it in my early years taught as a story about obedience. When God tells you to do something, you better do it. When I did ask about the killing, I was told that it was God, so it was OK.
Emphasize the gory details. We’ve all become too cowardly to truly uphold God’s will in the world. (Yes, I’ve actually heard this.) We can just hope folks like this aren’t too serious. Some things in the Bible are less inspired than others, and this is one of the less inspired. Bloodthirsty people did bloodthirsty things and blamed God. When people lived in a violent world God worked within their context. So things that might be commanded then could be forbidden now, not because God has changed but because he is staying the same, and working with us where we are. Let’s never read this in church and hope nobody notices. I could probably come up with some more given time. I’ll be interested to see how Bob Cornwall handles the text. He’s both a good preacher and accomplished scholar, so I expect his comments to be helpful. In the meantime, two things. Following a challenge on a similar text, I wrote two blog posts. The first was a story/dialogue discussing the text, titled The God-Talk Club and the She Bears, on my Jevlir Caravansary fiction blog. (In the God-Talk Club series I write dialogue without any intention of expressing my own point of view. It’s sort of an exercise for me in trying to express several views on a topic.) The second was a homily on the same passage, titled Real Guy Interpretation. Finally, I recently interviewed two authors, Allan Bevere, author of a book based on a series of Old Testament sermons he preached titled The Character of Our Discontent, and Alden Thompson, author of Who’s Afraid of the Old Testament God?. I’m embedding that video below. My friend and Energion author Allan Bevere posted this morning on this topic, and I want to call attention to it for several reasons. First, this is a topic I find very interesting. Second, I think it’s appropriate to discuss the problems of violence and suffering together at some points. Third, I don’t think that emphasizing a distinction between the Old and New Testaments really solves the problem. It ditches some texts, so if your plan is to explain things away text by text you make your task easier. But the basic issues remain the same. I also was reading my own book notes on Bart Ehrman’s book God’s Problem. Ehrman tends to set a lot of people off, but I don’t find him all that annoying. Do I disagree? Yes, in many ways. But that just makes life interesting. Recently, I published a book on this topic, Bruce Epperly’s Finding God in Suffering: A Journey with Job. It’s interesting to see what different results people get from reading the same material. Note that Epperly is a progressive Christian and his approach illustrates one of the problems in religious dialog: We dialog with one group and it is applied to a much broader group. I used Waltke in my notes (link above), and Waltke definitely takes a different approach from that of Ehrman. Yet so does Epperly, and it’s a different different approach. Then there’s the book Allan is reading, Who’s Afraid of the Old Testament God? As the publisher, I’m obviously very happy with that book, but I should add that Alden Thompson was my undergraduate advisor and taught me Hebrew (2nd & 3rd year). The fourth edition of the book was also the first title released by Energion Publications. Now, to add to the fun, we’re planning a discussion between Allan Bevere (The Character of Our Discontent), Alden Thompson, and myself. It’s scheduled for June 2, 2015. Watch for more information here or on any of my social media feeds. On Tuesday, January 6, 2015, I will be interviewing Dr. Bruce Epperly on his newly released book Finding God in Suffering: A Journey with Job. One of the things I love about both blogging and publishing is the number of interesting and capable people I get to interact with. It’s something I’ve missed since graduate school days—the opportunity to run my ideas up against people who can really challenge them. I think Dave and I are quite close to agreement, though I do think we have some difference of emphasis. Perhaps his is a more radical approach, and I think the parallel to ecclesiology and the Anabaptist movement as opposed to the more traditional reformers. In fact, labeling them “more traditional” may summarize the whole issue. This does not, of course, tell us who is right. I think my difference with Dave here would be that I allow for more variation for time, place, and culture. I think that is in one sense a minor difference, but not truly insignificant. The problem with radical reformation is that it may get derailed in practice. As I read Scripture, God has always led his people with some consideration for their starting point. I’ll say a bit more on this in a later paragraph regarding the study of Torah. So the perfect, or even the “better” becomes the enemy of the good. I see this in my own church. I can look from one angle and say, “There is so much wrong with this church.” (Some might note as a problem that it has Henry Neufeld as a member!) But if I look from another angle, there is so much that is going right in the church, including the fact that the gospel is being preached there regularly. What do I want to reform and when do I want to reform it? Of course, the reality is that I have very little to say on that. The pastoral staff and the church council do most of that work, and I’m involved in neither group. But there is a problem with the “gradual change” folks as well, and I think the reformation provides examples of this. Gradual change often becomes stagnation. We don’t become more Christlike on a continuing basis, but instead become, in our own eyes, more Christ-like than our neighbors and then hang out there, or even begin deteriorating from that point. I think that if you look at the energy and focus of the Methodist movement during John Wesley’s lifetime and then at the United Methodist Church now, you don’t see progress. But how does this relate to the Old Testament/New Testament continuity or discontinuity? To steal a phrase from Paul: Much in every way! I see the progress from the Old Testament to the New as one of moving to the next chapter of a book, one that we, as Christians, see as the climactic chapter. So there is a substantive change as we enter into the final phase, the solution of the whole mystery, the resolution of the conflict. That is very different. But at the same time, we should not say that previous chapters were bad because they weren’t providing the whole solution. Rather, those chapters led up to the final chapter. They provided the clues. They provided the background. the seeds of the conclusion were planted there. The priesthood of all believers, for example, is foreshadowed in Exodus 19:6, but it is a strong New Testament concept. The latter verses of Exodus 20 (after the giving of the 10 commandments) tell us something of why. The people were afraid and didn’t want god speaking directly to them. There was comfort in having Moses and Aaron handle that part for them. There was comfort in having a priesthood. I suspect that the priesthood of all believers frightens us now for the same reason. We share the same human failings as the people around Mt. Sinai. We’d like something solid and comfortable that doesn’t tell us things that are upsetting. They turned to the golden calf. We turn to our denominational structures. “We’re Methodists,” I’m told, “We don’t do things like that.” It’s the same avoidance. There is a tendency to think of the professional class of pastors keeping the people away from their priesthood. And there are doubtless times and places where that is what’s going on. But I see more of a refusal to take that much responsibility for our own souls, our own calling, and our own decision making. Because of the priesthood of all believers the failings of the church are my failings. I do not get to blame this on others. Jesus has called me. I do not have permission to blame it on the paid pastor. But God’s ideal for Israel, expressed in many of the very passages quoted in Hebrews, was the same. It was for all to know God for themselves. This is one of the things I have learned in studying about what Christians call the “ceremonial law.” It was a teaching tool. It was not God’s intention to leave the priesthood in the hands of the few. It was God’s intention to eventually have a nation of priests. Is there discontinuity? Yes, but it is the discontinuity of turning back to the ideal, to what God had planned all along. It is radical in the extent to which it is not radical. Dave asked how much we differ. I think not that much on the Old Testament/New Testament discontinuity, though I am ready to have this view adjusted. On the nature of reform and how to carry it out, perhaps we differ a bit more. I’ll have to write some more about ecclesiology. That might get us to the more serious differences. 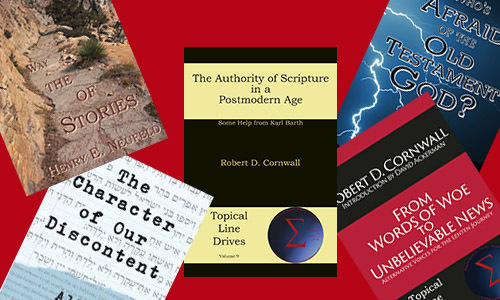 My company is offering special prices on all our books related to the Old Testament. I decided to blog a bit about the books we’re offering. So if you don’t want to hear about books that are for sale, this one isn’t for you. On the other hand, I promise to be wordy, tell stories, and fail to get to the point for paragraphs at a time. As usual! And by the way, this got started because we’ve put Ecclesiastes: A Participatory Study Guide, the first in the series on an Old Testament book, on pre-order. Look for it in mid-November. I’ll talk about it later in the week. This morning I was thinking about two books, because they relate so closely to my own Christian experience and to a weakness I see in the church and the way we teach the Bible. The first is by one of my college professors, Dr. Alden Thompson. He guided me through my second and third year of Hebrew as well as any number of questions that arose. I never did take an introduction to the Old Testament, though I took several Old Testament courses other than Hebrew, but I did dig into the theology enough to keep the discussion lively. Alden is primarily concerned with getting Christians to study the Old Testament more, and with letting people know that you can find God’s story of grace there as well as in the New Testament. 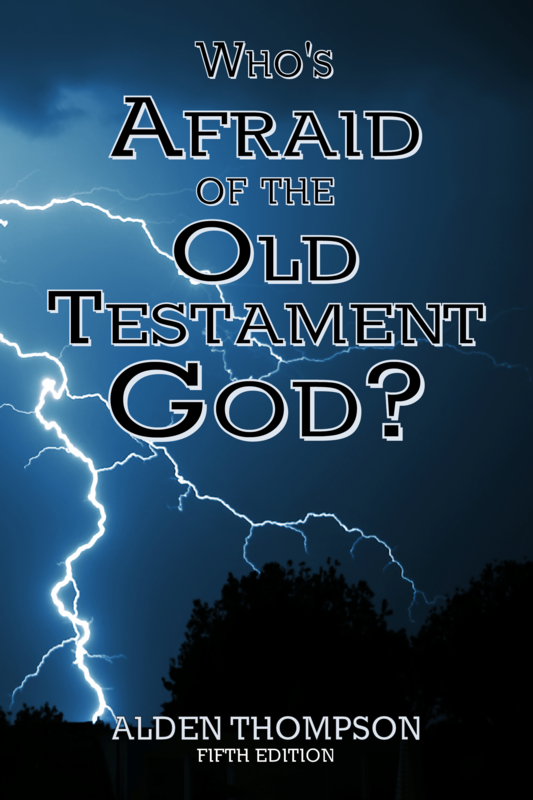 His book, Who’s Afraid of the Old Testament God?, was released after I graduated, but I read it with great interest, and when I was invited to teach later in a Methodist church, I found it was no longer in print. I got some remaindered copies from him, and then later got permission to issue two different comb bound editions. These got me through a number of classes, but we referred to one of them as the “unfortunate edition.” This was also before Energion Publications had come into existence. We issued a fourth edition, properly printed and bound, though the printer did not produce the best quality work. I purchased several thousand of those books from another organization I’d been working with and used that as the starting point for Energion Publications. So Who’s Afraid of the Old Testament God? (now in its fifth edition) is a key part of the history of the company. Alden’s focus can be found in two stories, I think. When I first contacted him about his book, some 20 years after we had last talked, his first question, before he wanted to talk about books, was this: “How are things with your soul?” Authors tend to care about their books, especially if there’s an opportunity to get them reprinted. But that was his first thought. Later, when he came to teach at Pine Forest United Methodist Church here in Pensacola, he told the group that the measure of his success as a teacher would be whether he left them loving God and one another more than when he came. I like that. The book itself can be mildly (or more than mildly) controversial, as one would expect of a book that has chapters covering Judges 19-21 (read it if you don’t understand why), and another on the Messianic prophecies. It’s easy to generate an argument on those topics. But I’ve seen a lot of people spending more time with their Old Testaments after hearing Alden speak about it. If nothing else, his enthusiasm for the topic draws people in. The second book is related, though it comes more from my present than my past. It’s written by Methodist pastor and seminary professor Allan R. Bevere. It’s based on sermons he preached from the Old Testament. Now there are those who are turned off by collections of sermons. I like them, provided they are good sermons that serve a purpose, and that they apply to a broad audience. The book is The Character of Our Discontent, I think this book has not gotten the attention it deserves. The vast majority of times that I hear sermons from the lectionary, the text is from the gospel lesson. Now I don’t have any problem preaching from the gospels. But I don’t think people will understand the whole story if they don’t get the background to the gospels by learning from the Bible Jesus used. So I’d see two purposes to this book. First, it can be read for devotional reading. I’d take an essay at a time. You’ll find your spiritual life growing when your devotionals don’t just come from the Sermon on the Mount, but also take in characters like Samson and texts from books such as Leviticus or Ezekiel. But second, if you’re a pastor, consider looking at this pattern of presenting material from the Old Testament. And unlike Alden Thompson, Allan Bevere is a New Testament scholar. Just because you specialize in the New Testament doesn’t mean you can’t include preaching from the Old. You may even have some special perspective.